This review has been originally posted on jasmin's library. Since I was little I loved to read everything related to mythology - mostly greek and egyptian, but norse mythology was also dearly loved. The daughter of friends of my parents taught me everything she knew - which was quite a lot - because she loved mythologies as well. 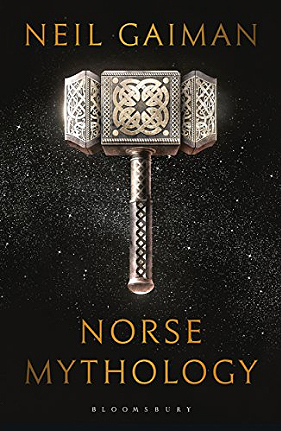 So when I stumbled over Norse Mythology by Neil Gaiman I couldn't do anything else than buy and read it. It consists of various short stories that weave around the norse gods and goddesses and interlace with each other. All in all this book was a perfect choice when I fell into a reading slump. It wasn't too heavy or too complex and so it was exactly what I needed. I discussed the book with a few people on my Instagram and found that not everyone liked it - which is totally fine! But nonetheless I am thankful that Gaiman took me back into a part of my childhood and woke my interest in mythologies once again. I decided that the style of Gaiman is one I really enjoy and decided real fast that I want to read more by him - to compare and to see whether all his books were like this one (especially American Gods got my interest). Reading about mythology again is also the reason I finally started the Percy Jackson-series - I can't get enough from mythologies and if I could I would read everything concerning it. 49.11% "well, this is a whole new turn on the story!"